Born in Madrid in 1963, Maria Torroba studied art in her hometown where she experimented with various techniques and themes. 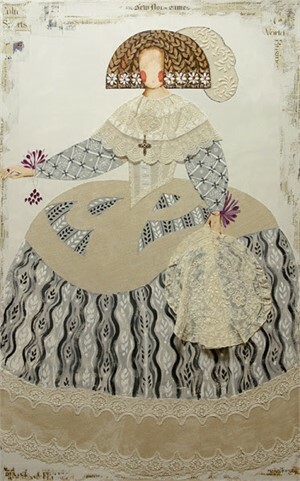 She earned recognition for her talents and was accepted into the prestigious Fine Arts program at the Pena Academy I Madrid from which she graduated with distinction in 1980. After studying art for a year in Oxford, England, Torroba became interested in famous portraiture by artists such as Italian Renaissance painter Domenico Ghirlandaio, English Tudor court painter Master John, and the iconic Spanish Baroque artist Diego Velazquez. Inspired by history, Torroba returned to Spain where she continues to work and re-examine historical portraiture. She is particularly interested in fifteenth – seventeenth-century paintings of royal and aristocratic families, including Giovanna Tornabuoni who patronized Mariana of Austria, wife of King Philip IV and whose portrait by Diego Velazquez in 1653 remains as an emblematic display of the wealth on the Spanish Empire. 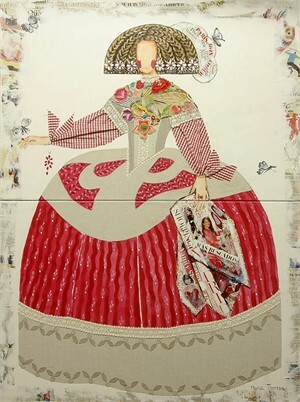 Using Canvas, oils, silk, lace newspapers and even some jewels, Torroba’s works come alive and her characters re-emerge as contemporary icons. Torroba has permanent works in Europe and abroad including Mexico, Dallas, and San Diego and Houston. 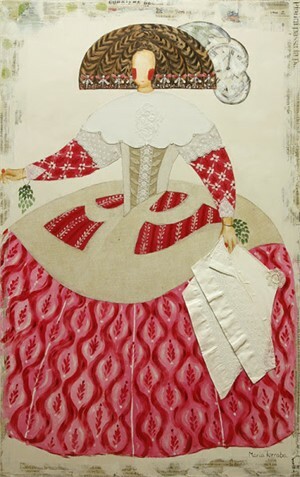 Born in Madrid in 1963, Maria Torroba studied art in her hometown where she experimented with various techniques and themes. She earned recognition for her talents and was accepted into the prestigious Fine Arts program at the Pena Academy I Madrid from which she graduated with distinction in 1980. After studying art for a year in Oxford, England, Torroba became interested in famous portraiture by artists such as Italian Renaissance painter Domenico Ghirlandaio, English Tudor court painter Master John, and the iconic Spanish Baroque artist Diego Velazquez. Inspired by history, Torroba returned to Spain where she continues to work and re-examine historical portraiture. She is particularly interested in fifteenth – seventeenth-century paintings of royal and aristocratic families, including Giovanna Tornabuoni who patronized Mariana of Austria, wife of King Philip IV and whose portrait by Diego Velazquez in 1653 remains as an emblematic display of the wealth on the Spanish Empire. 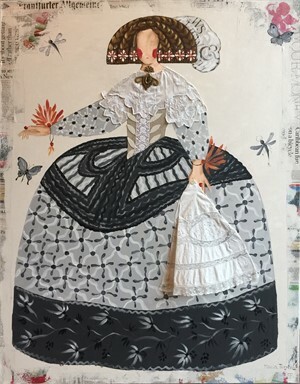 Using Canvas, oils, silk, lace newspapers and even some jewels, Torroba’s works come alive and her characters re-emerge as contemporary icons. Torroba has permanent works in Europe and abroad including Mexico, Dallas, and San Diego and Houston.